Revit, a type of Building Information Modeling or “BIM” software, is used widely in the U.S. to provide “real-life” information to clients, as well as a way for contractors to eliminate problems before they arise with a way to track costs. With an installed base of about 300,000 users and growing, it is rapidly becoming the industry standard for architects, mechanical and electrical engineers, plumbers, and HVAC installers. 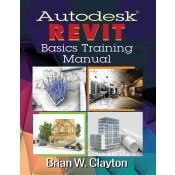 Focuses on the heart of the Revit software, so that users can improve their speed and productivity in the workplace or in classroom projects. Features the nuances of complex design software, with easy to grasp explanations and plenty of graphics to follow for visual learners. Enables readers to learn to navigate the software as beginners, or use the work as a quick reference to increase their productivity. Offers the most straight forward and efficient, step-by-step approach to understanding and mastering the Autodesk Revit software for users on any level. Is ideal for professional training and can be used in the classroom. Brian W. Clayton is owner of Clayton Consulting and Design, LLC. in Greensboro, N.C., and has more than 20 years of AutoCAD experience and eight years of Autodesk® Revit experience. Currently he works as a commercial building space designer, providing commercial space measuring and as-built drawings for property management companies. He also serves as an AutoCAD and Revit consultant for architectural and engineering firms, as well as a corporate trainer for the latest AutoCAD and Revit software. Furthermore, Mr. Clayton is an adjunct faculty member at various higher education institutions specializing in the facilitation of course work to students enrolled in Architectural Technology degree programs and continuing education programs. He specializes in technical training in various AutoCAD and Revit courses for the students and professionals who want to continue their education and keep up to date with the latest software and certifications. Ch 20: Revit Modify Commands.